With 171 students, Northport Public Schools has fewer kids in kindergarten through 12th grade than Okemos High School has in its marching band alone. Mackinaw City has 187 students; Alba, 174; Stanton Township, 138. All are tiny. All are poor -- as judged by the percentage of students receiving federal free lunch assistance. And all scored better in 4th grade math than larger, richer school districts across Michigan. In fact, poor rural districts beat the pants off richer districts in seven out of eight academic categories in Bridge Magazine’s Academic State Championships. Using a database of school statistics compiled by Public Sector Consultants and the Citizens Research Council, Bridge Magazine is honoring Michigan’s Academic State Champions in eight academic categories. Just like in the state’s football playoffs, the schools are split into eight divisions, by type of community (city, suburban, rural) and by percent of free lunch. And after all the numbers were crunched, College Readiness (as judged by ACT proficiency) was the only academic category in which a non-rural school (Bloomfield Hills) scored the highest in Michigan. Even in that category, small, rural Houghton-Portage finished second. Adams Township -- a neighbor to Houghton-Portage on the Keweenaw Peninsula -- with 433 students in kindergarten through 12th grade had the highest percentage of eighth-graders scoring proficient or better on the science section of the Michigan Educational Assessment Program (MEAP) test in fall 2010. The highest 8th grade math proficiency scores were found in Walkerville, enrollment 319. Twenty-one school districts tied for the Academic State Championship in 4th grade math, with 100 percent of students scoring proficient or better. Of those 21 districts, all are rural, and 15 are classified as poor and rural schools. What's going on in the hinterlands? The rural-school routs could be the result of small sample size. A group of smart kids can vastly improve scores in a small district, but would barely move the needle in a high school of 2,000. Some poor, rural schools scored consistently near the top of academic categories in Bridge’s analysis, but others were at the bottom. Larger schools often were packed in the middle. Most educators who spoke with Bridge about the Academic State Championships agreed that small schools have advantages that money can’t buy. In a district with fewer than two dozen fourth-graders, kids can’t hide in the back of a classroom, said Amber Ellis, third-grade teacher in Atlanta Community Schools, enrollment 306. Atlanta, located halfway between Gaylord and Alpena, tied for the overall top score in 4th grade math proficiency, with 100 percent of its students scoring at proficient level or higher. On top in the U.P. Adams Township School District was the overall champ of 8th grade science, with 96.3 percent of its students scoring at proficient or higher on the fall 2010 MEAP exam. Finishing second was Forest Hills Public Schools, with 96.1 percent; Ashley Community Schools (96 percent) was third. 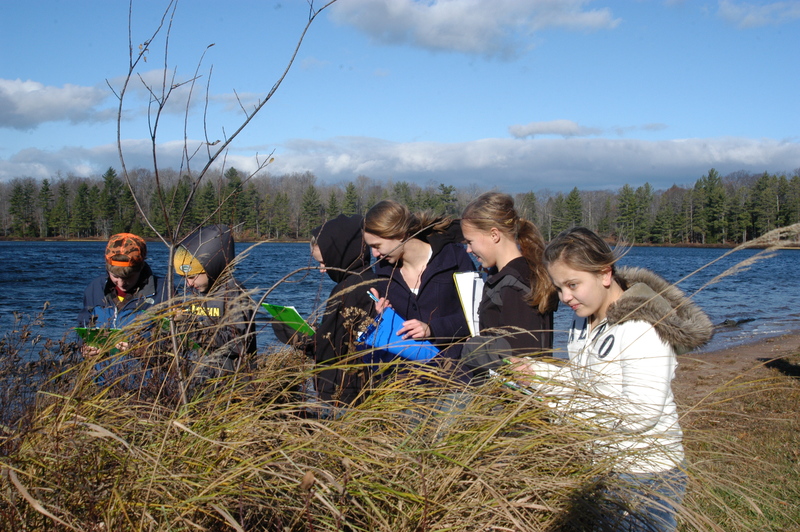 Another technique employed at Adams: a lake as a classroom. “We snow-shoe out there, we take water samples out there; we do a frog survey every spring,” said Mike Benda, assistant principal at Adams Township’s Jeffers High School. “We have cutting-edge equipment for water sampling and soil sampling and anemometers from donations (by an Adams Township resident). “If we need something, we can get it. In the regular classroom, students use electronic clickers to answer questions, letting teachers know immediately whether the minds are understanding the lessons. “Even the kids who don’t participate (in classroom discussion), they can participate with a clicker and we can tell if they know what I’m talking about,” Pera said. “The technology, combined with the labs (at the lake) and the fact that we’re a small school, maybe that all came together at the right time and space." Northport is a poor school district in a rich area. It overlooks Grand Traverse Bay near the tip of the Leelenau Peninsula and serves a community of farmers, blue-collar families and migrant workers. “Our families don’t have boats down in the harbor," noted Northport Superintendent Jeff Tropf. “If you’re expecting parents to educate kids, well, that works in some cases and doesn’t work in others. And those expectations are high. Northport tied with 20 other rural school districts for the top score in the state in 4th grade math proficiency, with 100 percent of its students scoring at proficient or higher on the MEAP. Northport also tied for the state’s top score in 4th grade reading, and was Bridge Magazine’s Division 8 State Champion for College Readiness. At Northport, 30 percent of high school juniors last fall were proficient on all four categories of the ACT, the highest percentage among poor rural schools. Second was Caseville Public Schools, with 28 percent. The average among all state school districts was 17 percent. * For rankings in 8th grade math, science and reading and 4th grade math, reading and writing, Bridge compared the percentage of students scoring at or above proficiency standards on the Michigan Educational Assessment Program (MEAP) from the 2010-11 school year. * For college readiness rankings, Bridge compared the percentage of juniors earning proficient scores in the four academic categories of the ACT in 2010-11 school year; Students needed to earn proficient scores in English, math, science and reading to be considered college-ready. * For graduation rankings, Bridge compared the four-year graduation rates (the percent of freshmen who graduate in four years) for 2010, the most recent year available. Bridge placed school districts in division by community type and socioeconomic status. Below 20 percent free lunch, 20 percent-40 percent free lunch and above 40 percent free lunch. Because there were only three city school districts with below 20 percent free lunch, those schools were included in the affluent suburban division. Division 1: City school districts with 20 percent-40 percent free lunch. Division 2: City school districts with over 40 percent free lunch. Division 3: City and suburban districts with under 20 percent free lunch. Division 4: Suburban districts with 20 percent-40 percent free lunch. Division 5: Suburban districts with over 40 percent free lunch. Division 6: Rural/town districts with under 20 percent free lunch. Division 7: Rural/town districts with 20 percent-40 percent free lunch. Division 8: rural/town districts with over 40 percent free lunch. Editor’s note: Detroit Public Schools, because of its size, did not have a true peer group and was left out of the championships. Bridge will hold a separate championship for schools within Detroit at a later date. Your tag line to this article --what lessons might be drawn from their performance to shape state policy--is likely the problem with larger school districts--> that they are too driven by policy. Learning is an individual activity--its bottom up, not top down--its fine if one district wants to copy or emulate another--voluntarily. Its another altogether to make it a matter of policy, In fact the more policy-driven you make education the less likely you are going to be able to see the results or innovations of small "lab-like" schools. Community, participation, family, words used in this essay are a key to success. Being small is an advantage as is relying on yourself in a system of education that recognizes that learning is not policy driven, its a natural endowment. Visit www.ted.com and listen to the three Ken Robinson video presentations starting with "How Schools are Killing Creativity". Next stop by the www.essentialschools.org web site and read their Ten Principles. If you're really ambitious pick up a copy of "Experience and Education" by John Dewey (libraries have it). Its a small book sharing the 100 year old educational philosophy that was developed with the University of Chicago Laboratory Schools those many years ago. You will find many elements (The title of Ken Robinson's Book) of your successful small schools on its few pages. Elements that were disregarded by the Committee of Ten in 1892 when they outlined the educational system still used today and, although recognized by Frederick Taylor in his writing on scientific management, pointedly ignored by the barons of industry intent on efficiency and the designers of 'efficient' schools preparing children for the 18th century. And if you really want to view the root malaise afflicting Michigan's schools visit the Michigan Department of Education web site and scroll through all the "shall have" policy dictates contained in law, law created by the legislature. It's is a policy wonks dream and a teachers nightmare. Every school has to comply with the very specific dictates contained in each of these - no wonder there is so little time for learning. And the larger the school system the more onerous the burden of policy compliance. Our children know how to learn and our teachers know how to coach and mentor them on that journey. Too bad those that are running the show are unable to embrace what works. I believe that rural schools do better because of instruction. One excellent math teacher my have these students for all three years in middle school. In a larger school, with say 20 teachers, the chances of getting an excellent teacher for one year is remote. Getting an excellent teacher for three years in a row at a large district is nearly impossible. I'm not saying that small districts have more excellent teachers, but when they do have one the effect shows more drasticly on the small number of students they have.